For years, I never considered making my own chicharrón de queso. Not because I thought it was too hard, but because I don’t have a flat top griddle like the taquerías do. I thought the hot griddle was the key to the texture and the high heat was responsible for the ability to mold it; but one day I had a nagging craving that forced me to experiment and I discovered it can be done at home in an easy way that doesn’t sacrifice any of the things that you’d expect from a good chicharrón de queso. Some notes: this recipe is for large individual sized portions (two people can easily share one). To make them larger to share with a group, just use additional cheese. You need to use Gouda cheese for this recipe; choose an economically priced piece that is soft enough to grate but not hard enough that it crumbles. Gouda is a semi-hard cheese and the more aged it gets, the harder it gets, and the more the flavor is intensified. So you want something kind of in the middle. The one I used here was an inexpensive double cream Gouda from Trader Joe’s. You’ll want to keep a paper towel handy so that if it gets a little too greasy during or after baking, you can just absorb the grease by lightly dabbing. Spread the grated Gouda loosely over the parchment paper in the shape of a circle or a rectangle with rounded edges. Put it on a stable cookie sheet or other flat surface for baking. If you’re cooking it in a toaster oven, put it on the lowest rack; if you’re using an oven broiler, put it on a high rack if using the low broiler setting or middle rack if using the high setting. You don’t want it to be too close to the heat source because as the cheese bakes under the heat, it’ll get a bit greasy and may splatter a little. If you notice that happening, it’s a good time to remove the cookie sheet and dab with a paper towel. The cheese should all melt together and bake until the edges are crispy looking and slightly browned. Remove the cookie sheet from the oven and while it’s still hot, gently bend the parchment paper into a cylinder and put it in the drinking glass to let the shape dry and set for a few minutes. Then, gently peel away the parchment paper and serve. 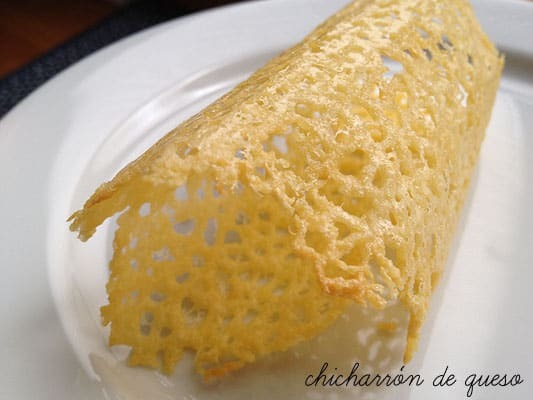 Do you have any memories of your first time eating chicharrón de queso? Have you ever made it at home? If not, will you now? I love chicharron de queso. I didn’t know about it until recently when we went to a taqueria in la condesa, and now I know how to make it! I love crunchy toasted cheese. Never been to Mexico City, but I surely would get some of this. It looks positively delicious. Thanks for sharing. I love this and have been known to make it for myself. Sooo good! My Grandmother always made these cheese crackers that were just to die for! These look just as yummy and even simpler to make. Think I might pick up some Gouda next time I go shopping. Can you do these with a cheddar? I’m sure you could do it with cheddar, just be sure to watch it while it’s baking to monitor if you need to blot oil from the cheese. My 10-year old daughter makes quesadillas at home. She was delighted when she accidentally spilled cheese on the griddle and tasted the crunchy result. I just took her to Mexico City a couple of weeks ago and had her try the chicharrón de queso and she loved it! Happy to have found your blog today. Can I use queso Oaxaca, or queso asadero? Hi Alex, I do NOT recommend using queso Oaxaca or asadero. Those cheese are typically too moist and will not produce the same crispness nor taste as the cheese used in the recipe as listed.